Can you remember a time when a topic as specific as capital leases versus operating leases garnered so much attention? Probably not. In fact, it’s been a fair amount of time since the accounting spotlight shined so brightly on leases, despite their habit of infiltrating nearly every nook and cranny of modern industry. Suffice it to say, the new lease guidance brought forward by ASC 842 has generated a level of conversation rarely seen, if ever, around lease accounting. 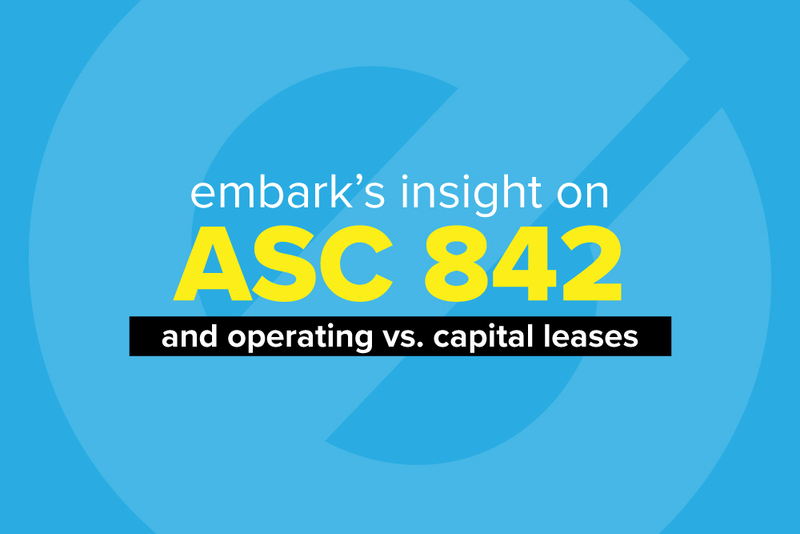 As you know, Embark has already devoted a significant amount of time on the changes to lease accounting through ASC 842 but, even so, wanted to spend a few moments looking at particular areas of changes with greater detail. So on that note, lend us your ear for a bit as we discuss the differences between capital leases and operating leases, why the topic is important, and provide a few best practices for your lease accounting along the way. Pair this knowledge with our handy Lease Classification Template for Lessees to provide your organization with the insights and tools needed to properly navigate the potentially confusing new lease accounting terrain. Embark is more than happy to help lead the way. While our intention isn’t to take a deep dive into the different lease types, discussing the differences between capital leases and operating leases is of particular importance given the specific changes due to the new lease accounting standards. Does the lease transfer ownership of the underlying asset to the lessee? Does the lease grant the lessee an option to purchase the underlying asset that the lessee is reasonably certain to exercise? Is the lease term a major part of the remaining economic life of the underlying asset? Does the PV of the sum of the lease payments equal or exceed substantially all of the fair value of the underlying asset? Is the underlying asset of such a specialized nature that it is expected to have no alternative use to the lessor at the end of the lease term? For any given lease, if you’re able to answer yes to any of those five questions, ASC 842 states the lease is a capital lease. Alternatively, if you are unable to answer yes to any of them, then it’s classified as an operating lease. As you might have guessed, that determination leads you directly to the next steps where the lease classification impacts your financials. Depending on the lease classification as determined by the five listed questions, the impact on a lessee’s financials can differ, especially relative to the previous guidance from ASC 840. Unlike the balance sheet, there’s some variance between operating and capital leases on the income statement. Line items for operating leases include the lease cost, calculating total lease expense and straight-line. Income statement items for capital leases, however, include the amortization expense of the asset and interest expense. The new lease accounting guidance isn’t entirely straightforward and requires both a thorough understanding as well as the tools to help companies remain in compliance without sacrificing efficiency. Between our previously mentioned Lease Classification Template, our Lessee’s Quick Guide to ASC 842, the additional information we’ve provided today on operating and capital leases, as well as a host of incredibly effective digital tools, adhering to the new lease accounting guidance doesn’t have to be a monumental feat. As always, Embark will be here to crack corny jokes, stretch metaphors beyond comprehension and, most importantly, impart our expertise and insight into the many changes impacting the accounting world. "I consider Embark a trusted business partner and a firm that is focused on my company’s best interests, not their own."